The 23rd Finale of the Great Orchestra of Christmas Charity (Polish: Wielka Orkiestra Świątecznej Pomocy, WOŚP) will be held on 11th January, 2015 in Poland. For the third time the Orchestra will play in Vilnius. The headquarters of the Foundation of the Great Orchestra of Christmas Charity has already been registered GOCC Staff in Vilnius. Organizers have announced concerts, presentations, meetings and demonstrations. Volunteers will be collecting funds for the treatment of pediatric wards and cancer, and to provide decent health care to seniors. The Great Orchestra of Christmas Charity unites Poles living in Poland, but also in many places around the world. During the 22nd edition on 12th January, 2014 Vilnius Orchestra headquarters was located in the House of Polish Culture. 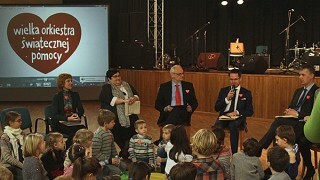 The money was collected by the students of Polish schools in Vilnius and the Vilnius region. The final concert took place at the same time in the House of Polish Culture and cafe called “Sakwa” (“The Bag”). Staff Vilnius GOCC Foundation donated to the account of the Great Orchestra of Christmas Charity approximately 15,000 LTL. “Staff GOCC was registered in Vilnius, but what will happen during the final, depends on all those who wish to join the events that will take place on that day. We look forward to suggestions so of teams that would like to experience, from the volunteers, who would like to collect the money. Anyone who wants to join the organization, will be welcome, “- said to the portal Wilnoteka Jacek Jan Komar, Chief of Staff of Vilnius GOCC. As stated by Jacek Jan Komar, proposals may be various. “Last year, Vilnius Wanderers Club organized until two shares, during which they were collected the money. They were Brainstorming and City Game. The team of” Happy Smiles “gave a concert at the DKP hour. There were also other teams. Known for television projects and delicious pastries Lucyna Rimgailė led confectionery workshop for children. She is also a tasting of exotic teas. this year, the ideas can also be various”- said Jacek Jan Komar. For reports of volunteers and participants Vilnius Staff GOCC waiting for Christmas. “By participating in the action the Poles in Lithuania – youth and adults – will be able to indicate their participation in the nationwide crackdown so noble that integrates all our compatriots at home and abroad, thus being a unique event in the world. We encourage all interested and indifferent to organize and participate in the action to the Great Orchestra of Christmas Charity in Vilnius played as loud as possible! “- Chief of Staff said Jacek Jan Komar. Tłumaczenie by Michał Sadowski	w ramach praktyk w Europejskiej Fundacji Praw Człowieka, www.efhr.eu. Translated by Michał Sadowski	within the framework of a traineeship programme of the European Foundation of Human Rights, www.efhr.eu.